Four teenagers - Mia Alice, Roll Kran, Pai Thunder, and Lamba Nom - are kidnapped by the nefarious Dr. Tarsan and made into living psychic weapons, with their memories completely erased. Dr. Tarsan plans to sell them to the powerful Bunker Space Pirates, but the kids themselves don’t like that plan too much and work together to escape, taking with them the powerful giant robot Dangaioh. Now the four must evade Dr. Tarsan, the Bunkers, and the insane cyborg Gil, all the while trying to get back their memories and find out who they really are. Dangaioh is an old OVA first released in 1987. Dangaioh is a quintessential eighties anime that favors a ton of style over substance. The animation is mind blowing; each episode is perfectly animated with vibrant colors and unique designs. 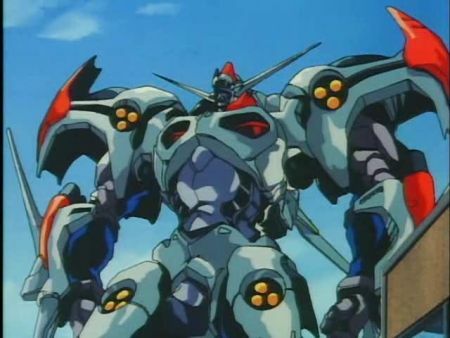 The mecha designs of Masami Ohbari are just gorgeous, everything from the largest battleships to the smallest robots has its own unique design. I love Obari’s knack for mixing mechanical and organic elements. Dangaioh itself is an amazingly kickass looking robot. Too bad all its attacks are carbon copies of earlier super robots, but it still looks damn good when it uses them. 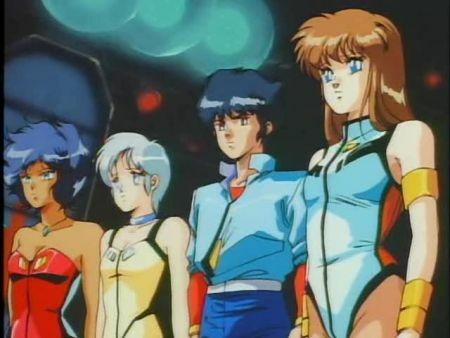 The character designs are very eighties, notice the hair, but still look pretty good, and all the female characters are definitely cute. As if the story summary didn’t give it away, plot wise Dangaioh makes no sense. It throws in the most random elements - ESP, lost princesses, cyborgs, evil scientists, giant robots, etc. - without trying to make any sense at all. The plot is also very simplistic, with the designated bad guy of the episode and no real depth to the characters’ histories. Dangaioh also sadly has only three episodes, with the third one ending on a cliff hanger, so we never have any idea what happens. Still, the show is filled with a kind of frenetic energy unique to the eighties. It didn’t matter if the story made sense as long as there were a bunch of good looking characters doing stylish things. And I can live with that. 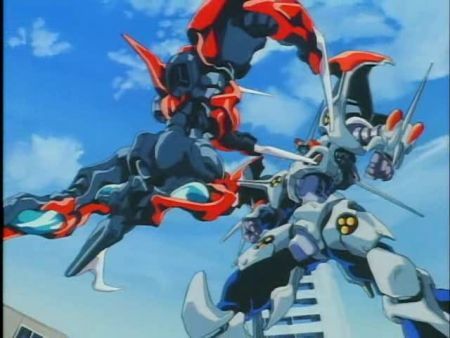 Dangaioh is definitely only for the dedicated mecha fan, but it’s still an exciting ride from beginning to end. And I have to say that Cross Fight is a damn catchy song.